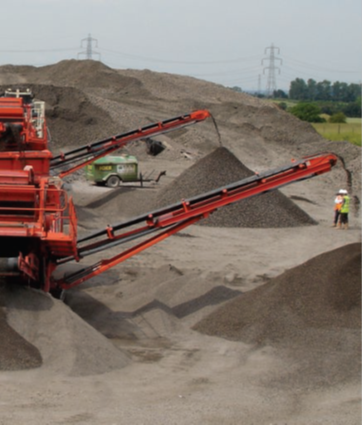 OCL can provide contract crushing and recycled material production at customer’s own depots on a permanent, interim or campaign basis. For large, specific, regeneration contracts OCL will mobilise plant to the specific construction site, or a suitable site nearby. A popular and often used option for site regeneration projects, where the construction site has previously been occupied for residential, commercial or industrial use or is a highway project requiring re-construction or re-instatement. In most cases the materials on site can be re-processed into new materials of similar engineering quality. 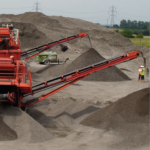 Crush, screen and process construction and demolition waste in-situ (or import as necessary) to generate finished recycled material (or feedstock for Foambase™/CBM products) to be utilised in the re-construction process or for removal from site. Provide QSRMC accredited site batch plants, which can be set up and batching within five hours, producing all grades of Cement, CBM’s and screeds at up to 400m3 per day. 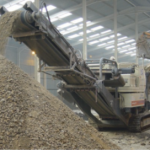 OCL’s focus on recycled and secondary aggregates, together with expertise in working with materials engineers and designers means that materials are always provided to the correct specification for each contract whilst optimising the use of available material. OCL can assist in establishing equivalences and can make extensive research and technical data available to aid this process. 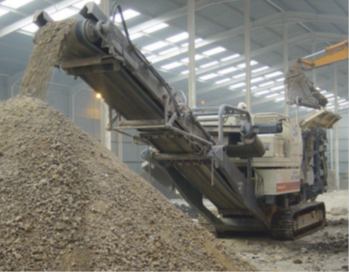 OCL’s fleet of crushers, screeners, mobile and mixing plant ensures the segregation of aggregates removing metals, woods, plastics, paper and other non-compliant material to derive quality, usable, aggregate and fill materials. This mobile plant solution ensures optimal use of waste material arisings and reduces vehicle movements.